rigorous standards of the industry. Up to 99% of infections are not detected due to the complexities of diagnosis of histoplasmosis and the limitations of traditional testing methods. It can take days or weeks, depending on the method, to get culture results from reference labs; and many histoplasmosis tests require invasive sample types. Better diagnostic tools are needed by researchers and medical professionals. With the Histoplasma Urinary Antigen EIA, there is no invasive sampling – standard urine collection delivers superior correlation to reference lab testing allowing for a fast, qualitative, histoplasmosis diagnosis. Results from reference labs can take days to obtain and can be expensive. With the OIDx Histoplasma Urinary Antigen EIA test, physicians can now obtain accurate results in less than 2 hours and begin to treat the patient without having to wait several days for a result from a reference laboratory, saving the hospital money in the process. The OIDx assay system utilizes a unique rabbit monoclonal antibody directed against a distinct antigenic determinant on the intact galactomannan molecule. The OIDx Histoplasma capsulatum Urinary Antigen EIA provides high sensitivity and specificity when compared to current in-house developed proprietary tests. The Histoplasma capsulatum Urinary Antigen EIA provides an easy to use format and breakaway wells allowing for small volume testing, yielding results in 90 minutes. Current diagnosis requires samples to either be evaluated by culture, which can take weeks, or to be sent to reference laboratories, which is expensive and can take 2-3 days for a result. Early diagnosis and treatment are essential to aid in reducing the high mortality rate. 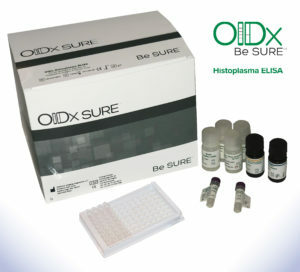 OIDx is pushing the boundaries of ELISA testing with Be SURE technology.